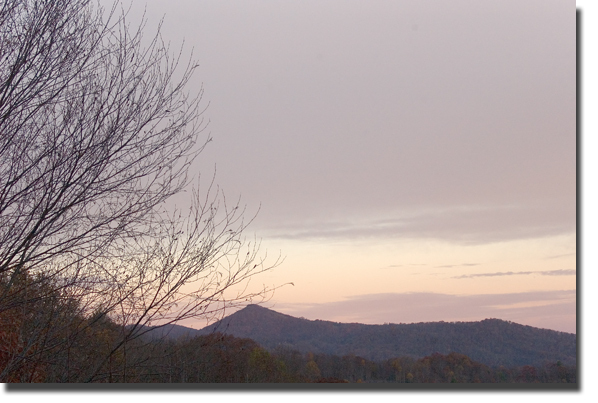 My Halloween morning began with muted colors and the observation of new view opportunities yielded by falling leaves. The observance of Halloween as a holiday has gone largely uncelebrated in our family this year. I think maybe living with teenagers is frightful enough year round so one day won't make much of a difference. But I may go to the store and buy some horrid off-brand candy . 1) My eldest started dissecting a cat yesterday in her Anatomy & Physiology class. She was almost too delighted in sharing with us the details over dinner last night. "Mine is extra furry and orange. It isn't as easy to skin a cat as you would think," she pointed out. 2) I worked the ASU-Furman game on Saturday. Strangely, the entire Furman team disappeared during the second quarter and never showed up to play the rest of the game after that. Wonder what happened to 'em? 3) And, I reckon the state of political obnoxiousness has reached an all-time high for when I entered my workplace restroom, I was besieged by a local politician's pamphlets. Pissed me off. Heh.